Murmelstein, who has become one of the eponyms for “Jewish collaboration,” was born 1905 in what is today Ukrainian L’viv, studied in Vienna and worked there as a rabbi. After the Anschluss in 1938, he started working in the Jewish Community, organizing the emigration, and quickly he was established as a skilled organizer and problem fixer who rose to serve as the deputy chairman. In January 1943, as the SS moved to liquidate the Jews remaining in Greater Germany, Murmelstein was deported to the Theresienstadt ghetto. Feared and unbeloved already in Vienna, his reputation preceded him to the ghetto, where he became the deputy Elder of the Jews and stepped forward with what was his strong suit: organizing masses of people under extreme circumstances. In late September 1944, one month after the liquidation of the Lodz ghetto, the SS killed the acting Elder of the Jews, the German Paul Eppstein, and installed Murmelstein as his successor to lead the Jews of Theresienstadt through the subsequent period of transports, which brought two thirds of the ghetto population to Auschwitz. Both the Theresienstadt ghetto and Murmelstein survived until the liberation by the Soviets on May 9, 1945. Subsequently, Murmelstein spent the next eighteen months in Czechoslovak custody, charged with collaboration. He was released, but until today, his name is used to exemplify Jewish collaboration. As a high-ranking Jewish functionary, Murmelstein was one of a decimated species. However, he was by no means the only one: in Theresienstadt survived also Leo Baeck, the chair person of the Reich Association of German Jews, with whom Murmelstein had a strained relationship; David Cohen, one of the two chairmen of the Amsterdam Jewish Council; whose colleague, Abraham Asscher, was liberated in Bergen-Belsen. Dov Weissmandl and Andrej Steiner, two prominent members of the Working Group of the Slovak Jewish Council, survived in Bratislava. David Gertler, the head of the Jewish police in Lodz, survived Auschwitz. In Vienna, the Red Army liberated Josef Löwenherz, the chairperson of the Viennese Jewish Community and Murmelstein’s old boss. Many of these men (and they were all men; Gisi Fleischmann, the female head of the Working group, was killed in Auschwitz) were keen to tell their version of events: some of them wrote memoirs or were interviewed. Indeed, Lanzmann interviewed Andrej Steiner, but, like much of the material, including items on Jewish Councils, self-administration, and the everyday life in the Holocaust, it did not make it to the Shoah. It is unfortunate that Lanzmann made the film without experts’ knowledge on Theresienstadt; the place of which in the German plans is well-researched. There is no need to, for instance, claim that the founding of Theresienstadt was heralded in newspapers, when in fact the German newspapers were prohibited to write about deportations of Jews, and hence also about Theresienstadt. Similarly, as the late Miroslav Kryl and myself have argued, Paul Eppstein had learned about the mass killings in Auschwitz, and in this context that we should understand his speech of September 1944. Eppstein, who together with a few Jewish functionaries learned from a careless remark of a SS man about the forthcoming transports of 5,000 men to Auschwitz, appealed to the population to stay calm under his stewardship. The commandant, Karl Rahm, knowing of Eppstein’s established leadership, had him killed. Rahm replaced Eppstein by the unpopular Murmelstein, the pragmatist and organizational genius, knowing well that he was too unpopular and would never incite anyone to revolt; rather, Murmelstein got the job (indeed nearly any job) done. Lanzmann quotes Eppstein’s speech in detail in an imposing shot at the gallows of the Small Fortress, erroneously concluding from the “courageous” speech to the motivation of the SS in killing Eppstein. Violence often carries a logic, functioning as a script; rather than destructive, it can be constructive, establish a new social order. This was one of the reasons why the SS killed Eppstein; to make clean slate for their absolute rule during the transports of fall 1944. This is also why, in the first months of the ghetto, in January and February 1942, Siegfried Seidl, the first commandant, had sixteen young men hanged for futile misdeeds. 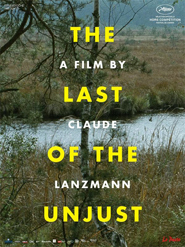 In an emotionally charged shot of the Ústí/Aussig barracks, Lanzmann misguidedly claims that the execution was a moment of the moral failure of the first Elder, Jakov Edelstein. Such an interpretation puts the event in a mistaken moralizing light, instead of recognizing it for what it was: the SS assuming total control, establishing themselves as sovereigns who can kill, without a reason. In moments like these, the Jewish functionaries experienced profound powerlessness – a defining experience for Holocaust victims. Depicting the functionaries as unheroic is not only a historic, but, moreover, it misses the interesting societal mechanism at hand. Every narrative is a social product: we tell stories to fit to our social surrounding, to create a logical past, and, in case of people who experienced violent, traumatic situations, to recount the story in a way endowing them with agency, with a sense of control. For a macher like Murmelstein, a choleric, alpha-male loner, to experience absolute impotence was extraordinarily upsetting. Therefore, in his postwar testimonies, he narrated agency into his actions; this is why he told that his perpetrators paid attention to and respected him. Murmelstein repeatedly brings up the chair episode: in a meeting with Eichmann in 1938, the later commandant, Karl Rahm, was ordered to provide a chair for Murmelstein. In this rendering, Rahm never recovered from the chair incident and treated Murmelstein with the respect. The problem is that Lanzmann presents the story at face value, while we know from testimonies of others that Rahm let Murmelstein wait for their meetings standing outside of his office for hours in the cold, and more than once beat him, giving him a black eye. Asymmetries of power influence who thinks about whom, and who remembers whom, and in how much detail. Just as a graduate student obsesses about his or her professor’s gestures, so did the Jewish functionaries overthink the commandant’s psychology, and the prisoners that of the guards’. Rahm and Eichmann spent few thoughts on Murmelstein’s views: for them, he was less than a human, a useful tool. This discrepancy is particularly striking in Rahm’s and Eichmann’s trial records (1947 and 1961-1962). Unfortunately, Lanzmann chose not to examine the archival records, most unfortunately the trial materials of the Czechoslovak investigations against Murmelstein. In June 1945, Murmelstein was arrested on the prodding of the Communist party Terezín. This investigation is the founding stone for anyone who wants to understand Murmelstein or Theresienstadt. Moreover, Theresienstadt, as much of the Holocaust, was a profoundly transnational place: In the ghetto Jews and people of Jewish background from Czechoslovakia, Germany, the Netherlands, Denmark, Austria, and Hungary created an enforced, yet deeply interconnected community. To understand Theresienstadt, one must be fluent in Czech, German, and Dutch. Using contemporaneous Czech sources would have allowed to sketch out Murmelstein’s personality. Karel Fleischmann, a Czech physician who was Murmelstein’s colleague in the Health Services, the medical department, described Murmelstein in a poem from 1943 as “Polish marching pudding” who often screams but “doesn’t have an evil bone in his body.”  Sources like these show the real people beyond the clichés of collaboration or heroism, allowing us instead to discern the victims for who they were: real people, full of ambivalences. A troubling aspect of The Last of the Unjust is the exoticizing, denigrating way Lanzmann presents what he sees as “Eastern Europe.” In a long opening shot, the director stands at the platform of the Bohušovice train station, from where until June 1943 the deportees had to walk to the ghetto. The camera suggests a desolate, forlorn periphery (not showing the memorial plaque). Later, in Nisko, Lanzmann makes a dig at the local night club. These asides strike me as cheap: is French countryside so mondaine? Are the RER stops – just to say Le Bourget – so charming? This exoticization of the location is particularly troublesome in the lingering shots at the Small Fortress, the Gestapo prison near the ghetto for political prisoners, independent, both administratively and practically, from the ghetto in the Great Fortress, located in the actual town. However, the filming location is not always marked as such. The eery atmosphere of the former prison has often been used to illustrate the ghetto, while in fact, mixing up two entirely different things. 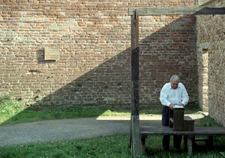 A picture of Lanzmann’s at the Small Fortress’ gallows was used as a key promotion image. This historical sloppiness seems to be symptomatic of Lanzmann’s approach to the entire film. Lanzmann, who shot the film well into his 80s, has grown somewhat self-indulgent. When promoting the film, he wrongly claimed that in 2007, a Viennese symposium at the Film Museum with the Murmelstein materials left him “totally outraged. I felt as if I’d been robbed. I thought: ‘it was me who did all that!’”  I was one of the presenters in Vienna; Lanzmann was happy that people were interested, for the audience hanging on his lips. Instead, I believe that he set out to turn the materials into a film because he did not want his work to be overshadowed by historians. This would be fine, as long as the result were historically accurate. Lanzmann, quite similar to Murmelstein, is also an alpha-male, but a charming, accomplished, smart one. Therefore, we see the two men bonding during the interview in Rome – even though Lanzmann knew little about Theresienstadt and Murmelstein was also continuously tutoring him. Viewing the material, we are sucked in into two dominant men bickering, bonding, joking, and it’s a pleasure to watch. That’s the key to the interview’s success. And yet it is important to know the context: other reviewers argued that we see a rare emotional bond, a unique moment when Lanzmann persuaded Murmelstein to talk. This is not the case at all: Pierre Genée, a Viennese historian who interviewed Murmelstein in the 1980s, remembered how Murmelstein was keen to get his view across; he was all too happy to be persuaded to be interviewed. A close look at the final scene of the film, at the Titus Arch, shows Murmelstein incessantly talking to Lanzmann, who, rather than listening, puts his arm around his much shorter companion. Lanzmann argues that Murmelstein was the smartest and most courageous among the Theresienstadt Elders; his rendering shows Murmelstein as a hero. Such moralizing characteristics are deeply amiss: They lead us astray from understanding people. While I am glad that a filmmaker of the caliber of Claude Lanzmann has questioned the concept of Jewish collaboration, it is important to note that he has done so with fifteen years of delay after Dan Diner, Doron Rabinovici, and Beate Meyer. What we need today is radical demystification, going beyond legends, showing Holocaust victims as the people they were, in a society changed by fear, desperation, and violence. Telling stories about heroic Jewish Elders, as understandable as it is, is in fact only another legend. Doron Rabinovici, Instanzen der Ohnmacht. Wien 1938–1945: Der Weg zum Judenrat (Frankfurt am Main: Jüdischer Verlag, 2000). The author will present on the Lanzmann’s movie on April 1, 2015, at EHESS at Florent Brayard’s colloquium: http://crh.ehess.fr/document.php?id=1257. Anna Hájková, “Der Judenälteste und seine SS–Männer: Benjamin Murmelstein, der letzte Judenälteste in Theresienstadt und seine Beziehung zu Adolf Eichmann und Karl Rahm,” in "Der Letzte der Ungerechten:" Der Judenälteste Benjamin Murmelstein in Filmen 1942-1975, eds. Ronny Loewy and Katharina Rauschenberger (Frankfurt/Main: Campus, 2011): 75-100. See Hájková, Prisoner Society in the Terezín Ghetto, 1941-1945 (PhD dissertation, University of Toronto, 2013): 80-86; David Cohen, Voorzitter van de Joodse Raad: De herinneringen van David Cohen (1941–1943), ed. by Eric Somers (Zutphen: Walpurg Pers, 2010). The footage is today at the United States Holocaust Memorial Museum (USHMM) Washington, STORY RG-60.5010, FILM ID: 3414-3419. See also the three-part documentary film on the Working group directed by Martin Šmok and Petr Bok, Among Blind Fools, 3 parts, Verafilm 1996-97; Katarína Hradská, Gizi Fleischmannová: Návrat nežiadúci (Bratislava: Albert Marenčin, 2012). David Gertler was interviewed by Isaiah Kupferstein in Munich in 1974; the interview (in Yiddish as an digitized sound file) is part of the Kupferstein collection (RG 697) in the YIVO YIVO Institute for Jewish Research (NY, USA). Andrej Angrick, Falkensee, is working on Gertler. Benjamin Murmelstein, Terezin: Il ghetto-modello di Eichmann (Rocca San Casciano: Cappelli, 1961). Sylvie Lindeperg, the author of La voie des images : Quatre histoires de tournage au printemps-été 1944 (Lagrasse: Verdier, 2013), which examines the propaganda film shot just before the beginning of the transports of fall 1944, was the only voice to point out Lanzmann’s lack of source criticism. Le Monde, November 12, 2013. Miroslav Kryl, “Die Deportationen aus Theresienstadt nach dem Osten im Spiegel des Tagebuch Willy Mahlers,” Theresienstädter Studien und Dokumente (1995): 69-92, 75; Hájková, “Prisoner Society in the Terezín Ghetto, 1941-1945” (PhD Diss, University of Toronto, 2013), chapter 1. See Walter Benjamin, “Zur Kritik der Gewalt,” Archiv für Sozialwissenschaft und Sozialpolitik, 47 (1920/21): 809–832. Statements of Ela Becková and Edvard Kurz, ABS [Archiv bezpečnostních složek, Prague, Czech Republic], 305-633-1 (investigations Murmelstein and other Terezín “collaborators”). Karel Fleischmann, “Pudding pochodówy,” YVA, O64, 74. Since that year the videos are accessible to scholars at the United States Holocaust Memorial Museum (USHMM) in Washington, DC; I was the first visitor to view them. Pierre Genée and Gabriele Anderl, “Wer war Dr. Benjamin Murmelstein? Biographische Streiflichter von Pierre Genee und Gabriele Anderl,” David 38 (September 1998): 9–20. Dan Diner, “Historisches Verstehen und Gegenrationalität. Der Judenrat als erkenntnistheoretische Warte,“ Zivilisation und Barbarei. Die widersprüchlichen Potentiale der Moderne. Detlev Peukert zum Gedenken, eds. Frank Bajohr, Werner Johe, and Uwe Lohalm, (Hamburg: Christians 1991): 307–321; Rabinovici, Instanzen; Beate Meyer, Tödliche Gratwanderung: Die Reichsvereinigung der Juden in Deutschland zwischen Hoffnung, Zwang, Selbstbehauptung und Verstrickung (1939–1945) (Göttingen: Wallstein, 2011).